This is my mother Claire’s special spaghetti egg extravaganza recipe. My mother loved it for an easy meal that made use of leftover pasta. I almost always make mine with fresh pasta. Either way it makes a delicious dish that everyone will enjoy! Ooo-la-la. When I was growing up, we had some type of pasta every single week. And since there were five kids plus my parents, my mom used to make a boat load. Invariably, there were leftovers. I’ve stated this before, but I’ll say it again: I wasn’t a big fan of leftovers. 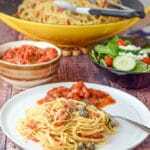 But when it came to this spaghetti egg extravaganza dish, I would line up with the rest of the clan to wait for a big portion of spaghetti goodness to be plopped on my plate. In fact, it’s a non-traditional dish that I never see or hear that others make! So yes, this is a great way to perk up leftover pasta. No one will remember it’s a day old because that’s how yummy this dish is. But of course, you don’t have to use leftovers, you can be like me. I cooked fresh Barilla®️ spaghetti to make this delish dish for myself. One thing my mom used to do any time she made pasta, was put a dollop of gravy (spaghetti sauce) in the pasta after it was drained and ready to be served. It would wet the pasta so it didn’t stick together and it caused the pasta to be just a little reddish. I remember when Christopher first came to our house and saw that we did that. He really didn’t know what to make of it. Now, I usually just put a little olive oil in the pasta, like most people do. Fusion Flavors are the Best! Instead of wetting the pasta with gravy, I used my homemade enchilada sauce. It gives it a nice little kick of spice! And to continue with that flair, I also added fajita veggies. I think my mother would have approved. 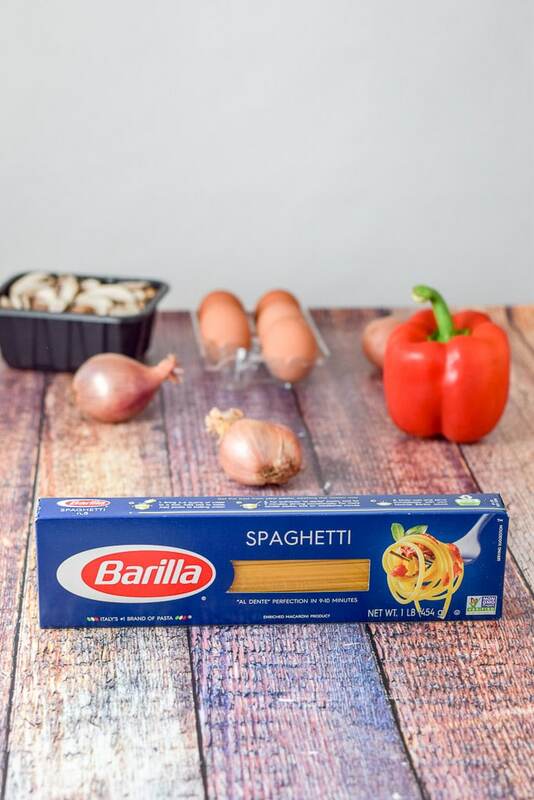 Here’s where you can find Barilla pasta in Big Y. 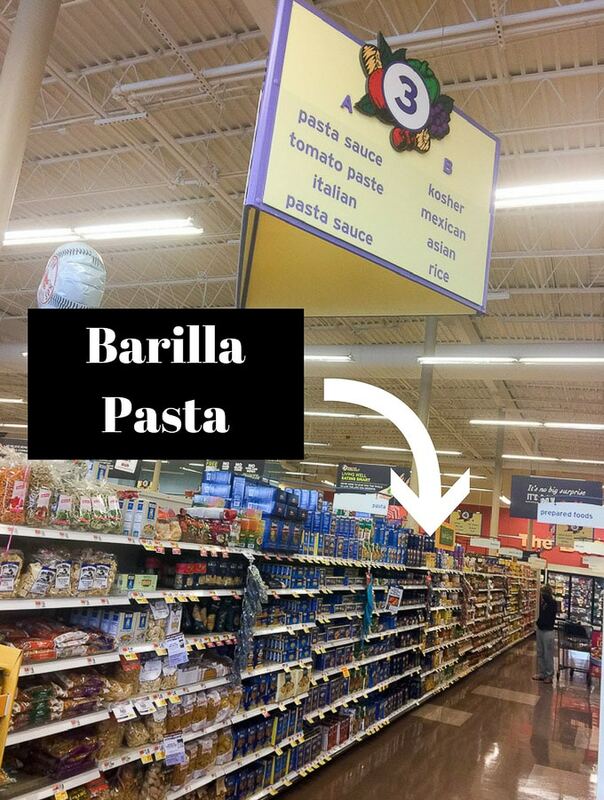 The pasta aisle is clearly marked so you can find the pasta near the front of the aisle. Close up of Barilla’s many pasta varieties! One of the things I love about shopping at Big Y is that the prices are better than other stores near by. Hence, I know I’m going to get a good deal. One of the things I love about Barilla pasta is how well it cooks. Some pastas are hard to judge and get mushy way before you think they should. Not Barilla. It holds its texture nicely. It’s a blank canvas for adding all types of ingredients that will give this delicious pasta your own unique twist. Doesn’t that sound like my kind of cooking? 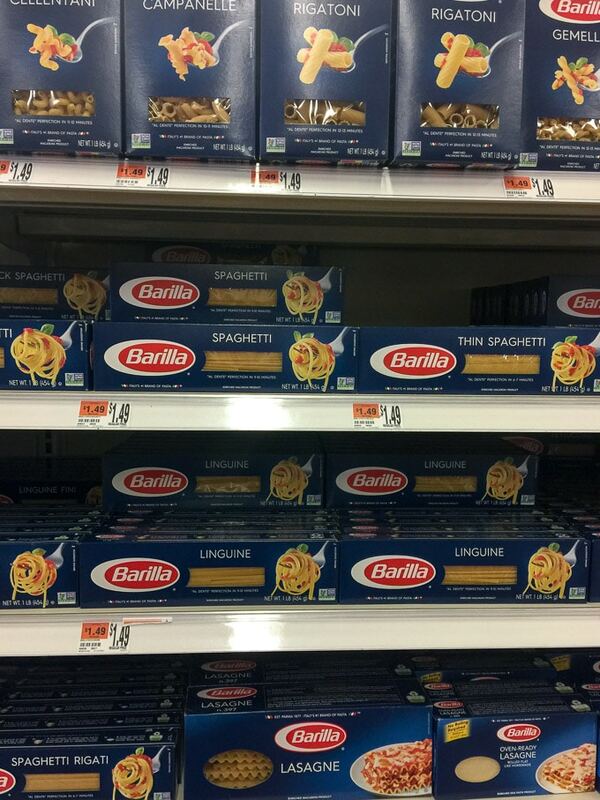 The other thing I love about the Barilla brand is what an awesome selection it has. I didn’t even photograph every kind on the shelves. I just gazed at them all. But I couldn’t stay to gaze too long because I had this delicious spaghetti egg extravaganza to make peeps, and there was no holding me back. 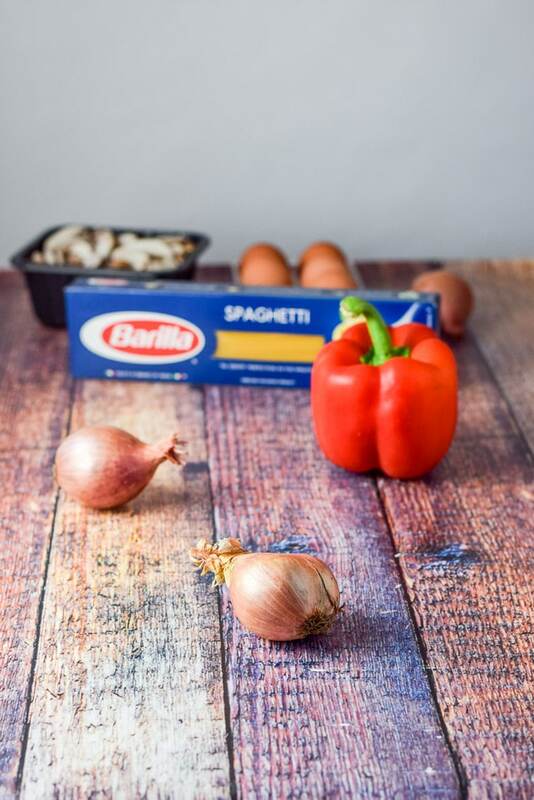 Here is the Barilla website where you can find fun games and win prizes. And here’s a link to some coupons. Barilla pasta, front and center. And do we need to know more? I start by setting some water to boil. Then I gather the shallots, a red bell pepper and baby portobello mushrooms. 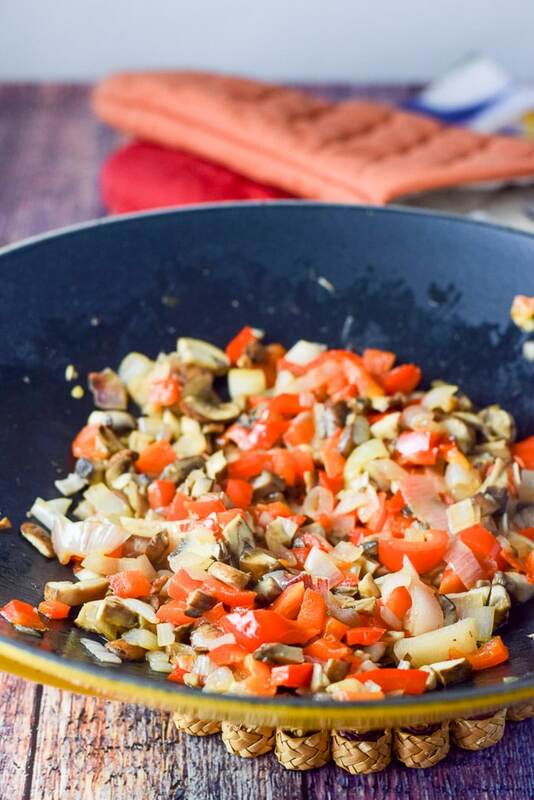 While my wok is heating up, I chop the shallots, peppers and mushrooms. I add 2 tablespoons olive oil and once that heats up, I add the shallots and pepper along with some salt. I sauté them for 7 minutes, then add the mushrooms and garlic and continue sautéing for 3 minutes. The water is boiling so I put in the Barilla spaghetti and set the timer for 10 minutes. I love my pasta al dente so I can sink my teeth into it. Thankfully, so does Christopher. But what about you? How do you like your pasta cooked? No doubt, please leave me a comment because I love to know! Perfect. First, I dump the spaghetti into a colander and give it a minute to drain. Then I pour the spaghetti in a bowl and dollop some chunky enchilada sauce over it. Also, I stir the spaghetti to coat it. I prefer mine fairly dry but with a reddish tint, like my mother’s. However, you might want to use more, depending on how much you love my enchilada sauce! Hehe! Now, I crack five eggs in my metal bowl and scramble them together. I heat up the wok again, I plop the spaghetti into the pan and pour the eggs on top of the spaghetti. I take my spatula and flip the spaghetti around allowing the eggs to cook and the vegetables to mix with the pasta. It takes around 3 minutes for the egg to set. See all those cute egg balls and tidbits? Finally, it’s time to plate this delicious spaghetti egg extravaganza! I put a bowl of the enchilada sauce on the table because Christopher is one of those people who likes to use more. I say it’s my cooking. Closer look, because who doesn’t like closeups? Hmmm? Above all I hope you enjoyed this recipe because this is truly a family favorite!! Hence, please feel free to leave me a comment. For instance, what is a dish that you enjoy that no one has heard of? I’d love to know. 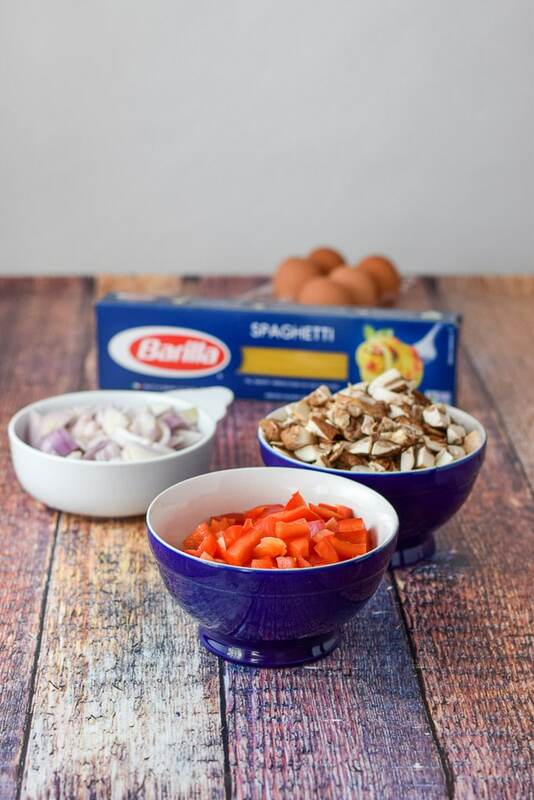 Also, remember to take a gander at the Barilla website here and grab your coupon here. 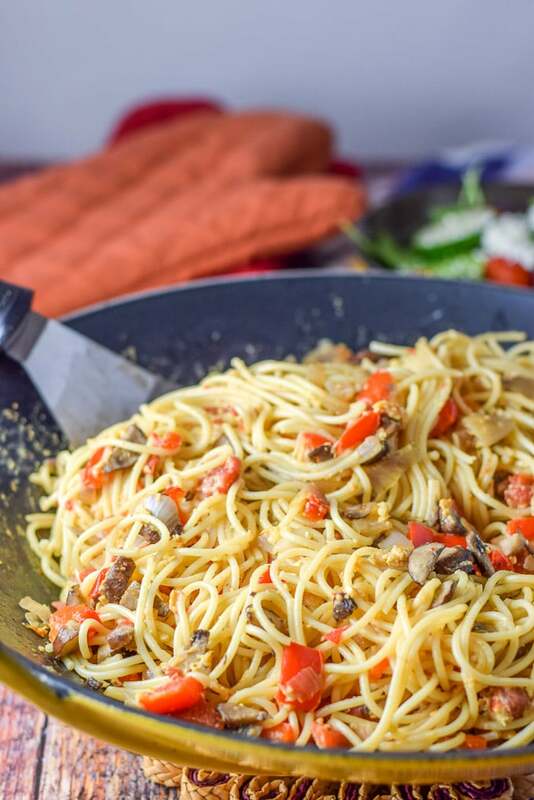 If you’ve tried this spaghetti egg extravaganza or any other recipe on the blog, I’d love the hear what you thought about it in the comments below. I love hearing from you! You can also FOLLOW ME on FACEBOOK, TWITTER, INSTAGRAM and PINTEREST to see more of my delicious food and delightful cocktails! 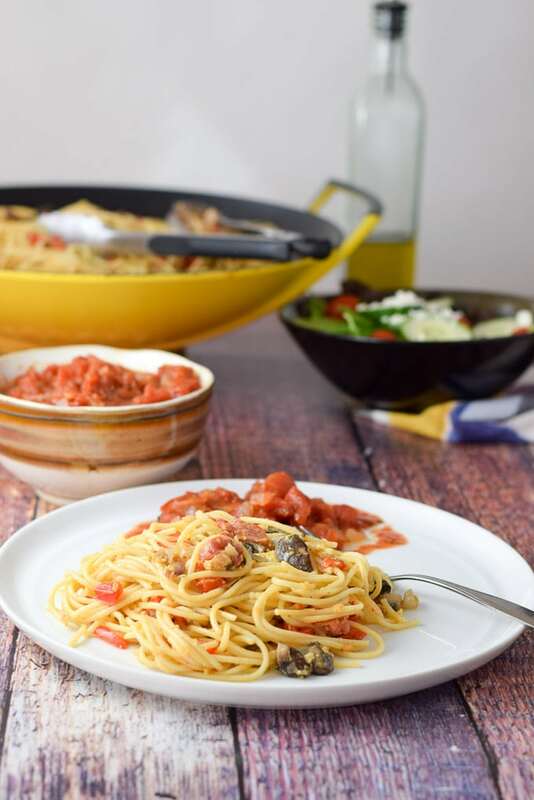 A different take on the typical Italian spaghetti meal! 1, 28 ounce can of diced tomatoes (I like my sauce chunky), 1 teaspoon cumin, 2 teaspoons oregano, 1 teaspoon or more of chili powder, 1/2 teaspoon salt. Place all the ingredients in a saucepan and bring to a boil. Lower heat to a simmer and cook for 15 minutes. This is kind of like Carbonara with lots of great vitamins! My favorite pasta is carbonara! 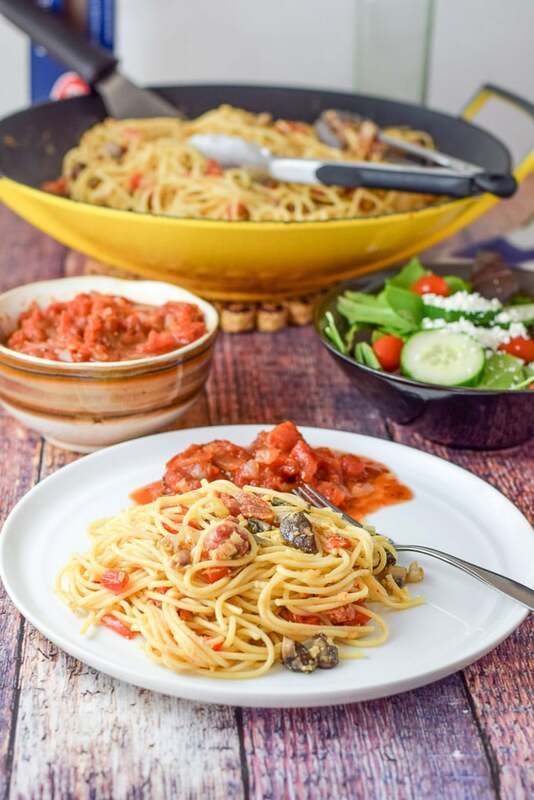 I love the tomatoes and peppers in this pasta! I have to give this a try! Great one, Elaine! Thanks so much Beth! You’re right, it kind of reminds me of Carbonara, it’s just eggier! (Is that a word?) 😉 Thanks for your comment. I have a real problem with making too much pasta. lol. This will come in handy! Ben! Thanks, yes, I do too sometimes, much to my hubby’s delight! I love pasta any way, shape, or form. I was raised on pasta that was over cooked (my mom didn’t like Al dente) but I have grown to appreciate al dente pasta. This recipe looks super yummy! Thanks so much Jennifer. I can’t stand overdone pasta myself!! I appreciate you commenting! I buy Barilla all the time. It is a great pasta for sure. I often like to clean out my fridge and combine pasta in the recipe too. In my opinion…you an never go wrong with pasta no matter how you choose to serve it. So true Gloria! Thank you for your comment, I so appreciate it! I love your photos showing how awesome this dish is! So many awesome flavors and I love this take on a family favorite. AnnMarie, I always assume people don’t put the gravy in the pasta because I never saw it growing up other than in my house. It’s so nice to see that others do that! This looks absolutely delicious, and definitely one to try. ? Al dente pasta is essential… it’s absolutely perfect that way! What a good idea!!! It’s like fried rice but with pasta- it sounds delicious! Thank you Sarah! I appreciate your comment! love it, love it , love it. I also fry left over pasta and I love it so much that I make extra pasta to have leftover. Yum! Laura! Cool. It perks it up, doesn’t it?!! Thanks so much Patty!! I love Barilla! I always set my timer too, perfect every time! We have pasta once a week and it’s great to get some new ideas on how to serve it. My boys will just love the enchilada sauce! Thanks Amanda. I love figuring out different ways to eat pasta to keep it interesting. The only way of eating pasta is al dente 🙂 . What nice flavors you have in this pasta dish! Thank you Nicoletta!! I appreciate it! I don’t care whether the pasta is leftover or freshly cooked, just serve me this dish! Yum. Such an interesting twist, using enchilada sauce instead of tomato sauce. I bet the eggs make this nice and creamy. Thanks Julie! I love the eggs in it! I LOVE Barilla pasta! It’s the only brand I buy and because they now carry gluten free pasta, I’m 100% loyal to them only! So thanks for the coupon link!! I’ve never made my own pasta; I’d love to learn how to do that! This recipe sounds amazing! Really – you dont like leftovers? Oh I just love them!!! Great recipe and I loved your blog post!! Thanks so much Amanda! I eat leftovers more now, but not a big fan! Thanks Cheryl! No eggs for you? Coming right up! This will make a perfect meal for the weeknights! I the sauce looks amazing! Thank you Kate!! I appreciate your comment! Loving this zesty pasta recipe! We’re big pasta eaters in my house and are always looking for new recipes. 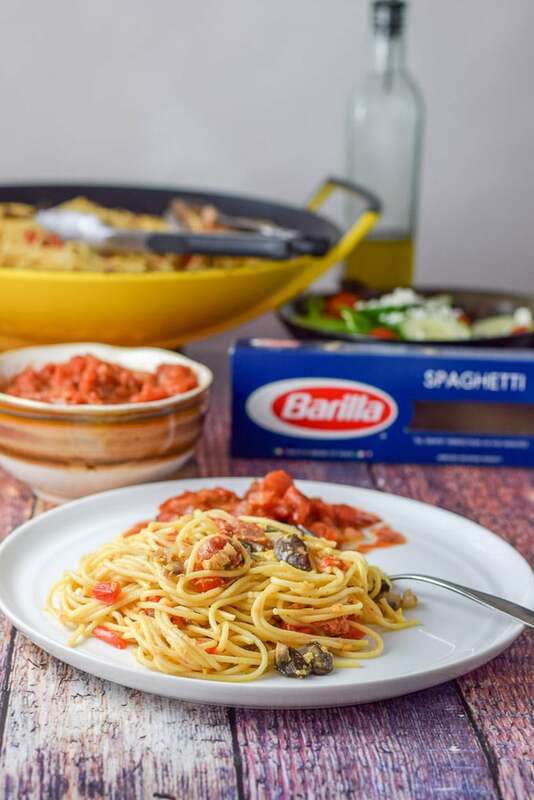 Barilla is one of our favorite brands, too! Love making dishes with all of the different shapes they offer. Will be saving this recipe to make soon! Thank you Amanda!! I love all different shapes of pasta too! 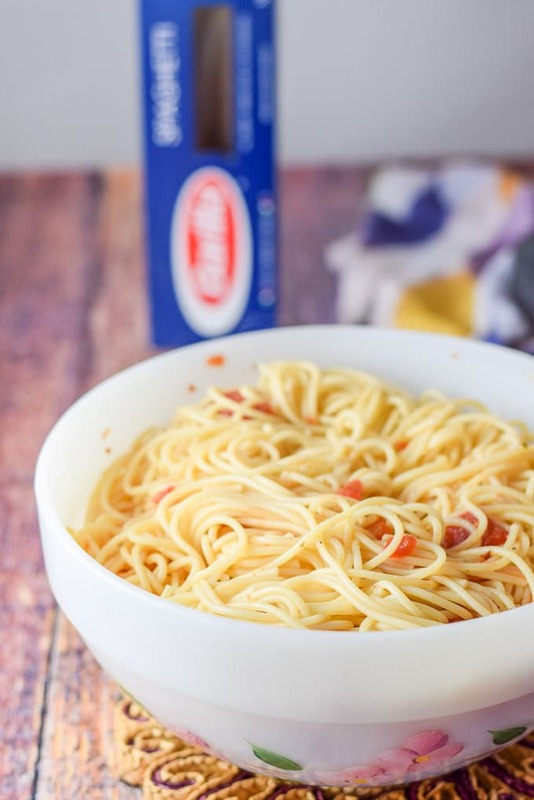 I’m also a big fan of al dente pasta – luckily I married into an Italian family so that’s A-OK! Love including eggs in pasta dishes – this one looks like a great meal!